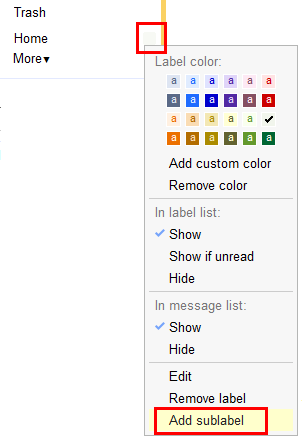 Gmail added nested labels in April 2010. If you have the labels Home/Family and Home/Vacation you also need a label Home. 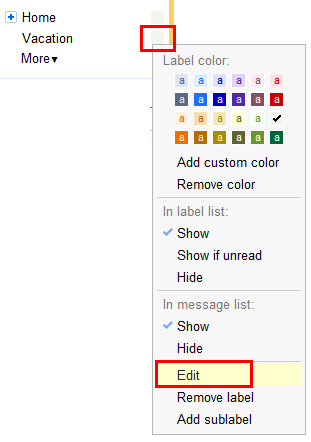 If you switch from Folders4Gmail or Better Gmail to Nested Labels, you have to create the parent labels. In child labels, you must write the parentlabel name exactly as in the parentlabel. Finding parent labels is case sensitive. For example, a label HOME/Vacation will not recognize the label Home as its parentlabel. Problem: The label HOME/Vacation does not match the case of the label Home. Some users want to see all emails in a label and its child labels when they click the label’s name. Nested Labels doesn’t do this, but the LabelLinks userscript does. If you LabelLinks it instead of Nested Labels, you can click on the little » marks right of label. If you want the filter to match any emails labeled Home/Family, you must search for labeled:home-family. You must spell the name of the label as it is shown in the search box, when you click on the label. Note that this kind of filter is fragile, because it depends on the order of the filters in the filter view. Also Gmail gives you a warning if you create a filter like this. If this Readme doesn’t help you, search the Nested Labels Google Group. Ignore the announcement that new posts are disabled, they are not. When asking for help, it’s best to upload a screenshot that shows your problem. That makes it easier for other people to see what’s wrong. Get the updated version from the Folders4Gmail page. The program Crocopat was created – among other things – to find design patterns. But it has its own input format and cannot read Java source code directly. So it is hard to determine how good the program really is in finding design patterns. The goal of this paper is to create a tool, which converts Java projects into Crocopat’s input format. Then different design patterns shall be tested to evaluate how well searching for design patterns with Crocopat really works. A week after Gmail added Drag and Drop to their labels, Folders4Gmail is working again. Get the latest version here. Also, remember that you should select show all in Gmail’s Settings > Labels tab. This is not strictly necessary for Folders4Gmail to work. But if you don’t select show all, half of your labels will hide in the sublabels and the other half under Gmail’sá More button. Sorry to all of you who have waited patiently for the update. Unfortunately, this time fixing the script was much harder than usual. The update (version 1.5) didn’t work with ths Gmail Labs Tasks feature. Fixed in version 1.51. Thanks to Scott Dafforn, who found the problem. Update 2 (July 9, 2009) The updated script (version 1.5) used a lot of CPU time. Hopefully, the problem should be fixed now (version 1.52). Update: Since October 2009 you should use Google Docs Batch Export instead. Since last month the Google Docs Data API has support for downloading documents. Here’s a small demo that downloads 10 of your documents as a .zip file. The demo will only download up to 10 documents and it won’t download documents bigger than 1 MB. This is because the demo runs on Google App Engine, which restricts the size and response time of HTTP-responses. Wait for the download of the .zip file. This can take up to 60 seconds. Gmail made some very minor changes to their website (they renamed their Html-classes). Unfortunately, it was enough to break Folders4Gmail. Please install the latest version of Folders4Gmail to make it work again. Version 1.41 also works better with right-to-left languages like Hebrew and Arabic. For those of you using Better Gmail 2, I emailed lifehacker.com about the update. So there should be an update for Better Gmail in a couple of days. Sorry for the trouble. Unfortunately, userscripts are very vulnerable to such small website changes. Folders4Gmail got an update to version 1.4. You can get the new version from the Folders4Gmail page. Folders4Gmail now works when the the Gmail Labs setting “Hide unread count” is enabled. Folders4Gmail now runs on IE7Pro for Internet Explorer. The other Greasemonkey-plugin for Internet Explorer, Turnabout from Reify, was unchanged for some years and now their website is shut down. Get notified by RSS when you have new Ebay feedback.